Monday: Presidents' Day holiday (U.S. financial markets closed). 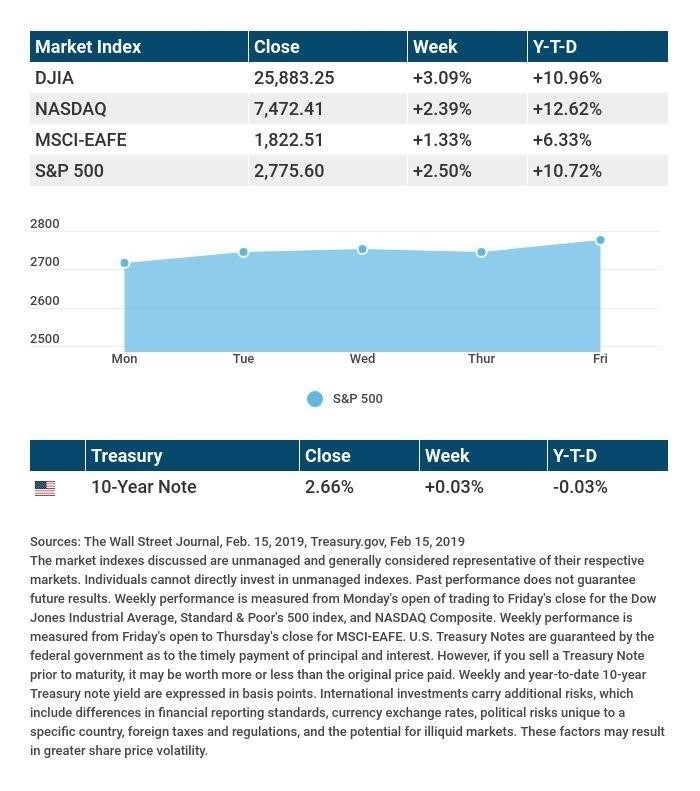 Source: Econoday / MarketWatch Calendar, February 8, 2019 The content is developed from sources believed to be providing accurate information. The forecasts or forward-looking statements are based on assumptions and may not materialize. The forecasts also are subject to revision. The release of data may be delayed without notice for a variety of reasons, including the shutdown of the government agency or change at the private institution that handles the material. Source: Morningstar.com, February 8, 2019 Companies mentioned are for informational purposes only. It should not be considered a solicitation for the purchase or sale of the securities. Any investment should be consistent with your objectives, time frame and risk tolerance. The return and principal value of investments will fluctuate as market conditions change. When sold, investments may be worth more or less than their original cost. Companies may reschedule when they report earnings without notice. The MSCI EAFE Index was created by Morgan Stanley Capital International (MSCI) that serves as a benchmark of the performance in major international equity markets as represented by 21 major MSCI indices from Europe, Australia, and Southeast Asia. These are the views of Platinum Advisor Strategies, LLC, and not necessarily those of the named representative, Broker dealer or Investment Advisor and should not be construed as investment advice. Neither the named representative nor the named Broker dealer or Investment Advisor gives tax or legal advice. All information is believed to be from reliable sources; however, we make no representation as to its completeness or accuracy. Please consult your financial advisor for further information. By clicking on these links, you will leave our server, as the links are located on another server. We have not independently verified the information available through this link. The link is provided to you as a matter of interest. Please click on the links below to leave and proceed to the selected site.